On 4 March the Swiss will vote in a referendum on the 'No-Billag' proposal. 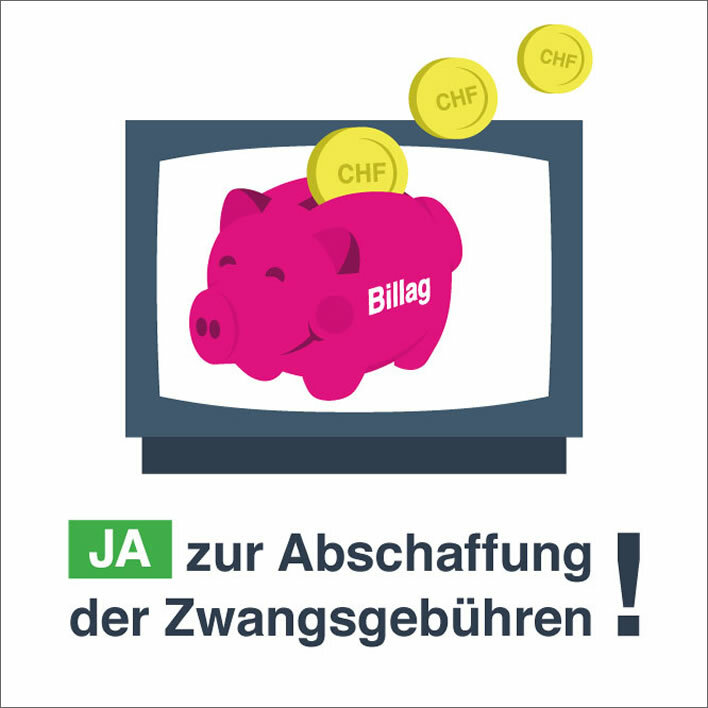 'Billag' is the name of the company that administers the collection of payments for the Swiss broadcasting licence fee (Bill A[ktien]G[esellschaft] – geddit?). For the free-markat, laissez-faire, knuckle-dragging, right-wing thugs in Switzerland the annual invoice for the licence fee has become an intolerable, forced legal theft of money by a state monopolist. The Schweizerische Radio- und Fernsehgesellschaft (SRG) – the main Swiss state broadcaster, the equivalent of the BBC in Britain – enjoys an untouchable income stream. The costs are high: for a population of 8.5 million the current annual fee is over 450 CHF, the most expensive broadcasting fee in Europe (the UK licence fee is less than half the price: 215 CHF). These high costs are partly due to the need to broadcast in four languages to small populations, but the lack of transparency over this annual poll-tax, its regressive nature and the difficulty of escaping its grip – not having a TV or a radio is not a sufficient excuse – plus, of course, the left-wing, politically correct bias of its offerings have fuelled a growing opposition in recent years. Switzerland is also a special case in that, as a small country in the middle of Europe, there is no shortage of programmes in German, French and Italian coming from neighbouring countries. Add to that content from the likes of Amazon and Netflix etc. After years of grumbling it has at last come to a referendum on the issue. It is difficult to imagine that the Swiss will vote to abolish the licence fee: they are too rich and set in their ways, but the chance is always there: you never know with referendums. If they did vote to scrap the licence fee then the fireworks would really begin. The left-wing Zurich Tages-Anzeiger (contra NoBillag) yesterday brought us the heartrending case of the Swiss farmer, Heinz Kummli, who likes to listen to Swiss Schlagermusik (don't ask) on the radio while milking his cows. The question of why he is allowed to torture his animals in this way was not raised, but the reporter was surprised to find that the farmer was minded to vote to scrap the licence fee. So it will be with many Swiss: the choice between saving 450 CHF or being able to listen to free Schlagermusik. The latest turn of events is that even the proponents of the No-Billag initiative have lost their nerve at the thought of the plug being pulled on the official broadcaster. The public opinion polls were not looking good for them. Now, making things up as they go along, they are perversely suggesting several scenarios for keeping the SRG going, most of which require support by the taxpayer. Neglecting the slight improvement of raising money through progressive taxation instead of a regressive poll-tax, the fundamental problem remains: why should non-users of the SRG's broadcasts pay for Farmer Kummli's Schlagermusik? Please don't say 'solidarity' or 'public service'. Furthermore, if you live in a hut in the Alps with no TV, radio or internet – bliss! – thus escaping the present fee, what improvement is it if you will have to contribute to the costs of everyone else's consumption? And a new problem appears: what has the government got to do with the broadcasting of Schlagermusik or indeed anything at all? Why let them mess that up along with all the other things they mess up already? Will Farmer Kummli's Doris, Simonetta, Eveline et al. appreciate having to listen to tedious studio discussions on subjects such as the way forward for electric vehicles or Obama's legacy or will they long for a good blast of '17 Jahr, blondes Haar' to get their udders swinging in the dark hours in the shed? As expected the Swiss did not accept the 'No-Billag' initiative in today's referendum. Some commentators, however, are surprised how decisive the result was: Yes, 28.4 percent; No, 71.6 percent. Our feeling is that the proposal simply to abolish the source of the state broadcaster's funding was too negative and left the result of turning off the money tap unclear. Nevertheless, Swiss referendum decisions can have their effect even when lost: the General Director of the SRG has accepted the need for reform, for savings and slimming down on the bloat. The problem of the changing media landscape has not gone away, though.